A discussion about DG interconnection processes and approaches for mitigating impacts of distributed energy resources. Learn more. A review of key findings from the recently released Renewable Energy Costs in the Pacific report. Learn more. The Tenth Clean Energy Ministerial will provide a platform for high-level policy dialogue and sharing of best practices to help accelerate the transition to a low carbon future; international collaboration on clean energy innovation and adoption of clean energy policies and practices; and public-private engagement to build cooperation among industry, government and civil society to scale up clean energy around the globe. Learn more. The Women Deliver 2019 Conference will focus on issues from health, nutrition, education, economic and political empowerment to human rights, good governance, and girls’ and women’s agency and equality. Learn more. The Asia Clean Energy Forum (ACEF) focuses on bringing together a diverse community of practitioners and implementers to identify, discuss and address the key clean energy challenges faced in the region. This year, ACEF will focus on the challenge of effectively using knowledge to increase the scale and speed of clean energy deployment. Learn more. The SOCAP (Social Capital Markets) event will convene over 3,000 investors, entrepreneurs and innovative cross-sector practitioners dedicated to increasing the flow of capital towards social good. Learn more. 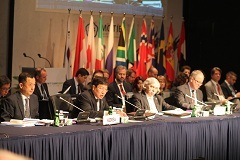 Energy ministers from around the world attend the fifth Clean Energy Ministerial. Picture by IISD Reporting Services.